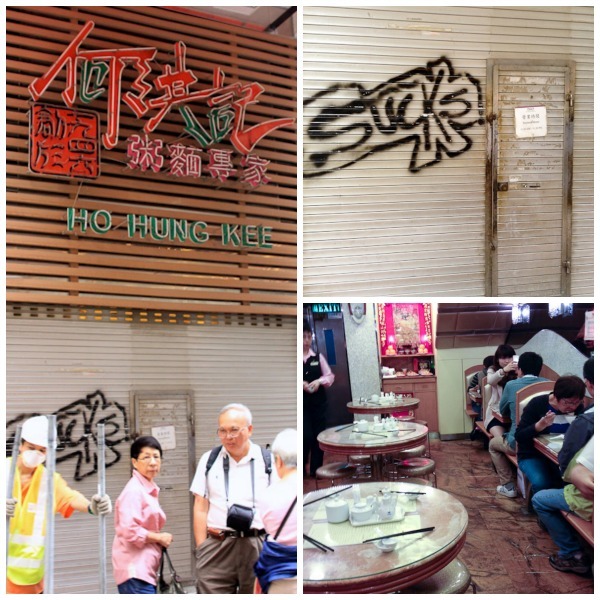 Ho Hung Kee, a tiny hole-in-the-wall noodle shop amidst the cacophony of Hong Kong’s Causeway Bay has once again been anointed one star in the Michelin Guide 2013. All in all, Hong Kong has 61 restaurants with Michelin stars and a handful of the them afford working class locals and visitors a chance to experience authentic noodles, dim sum and Cantonese cuisine at an acclaimed one star without breaking the bank. 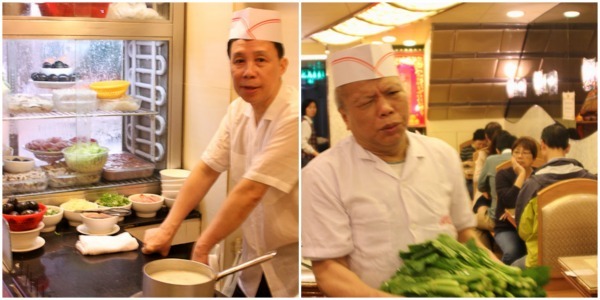 Listed as “simple shops” in the Michelin guide, Ho Hung Kee was first awarded a Michelin star in 2011. Still, little has changed at the heart of this eatery that began as a Wan Chai street stall in 1946 aside from progressing to an actual brick and mortar that’s not much larger than the average garage in America. According to the Where Hong Kong book in our room, the menu served today is the same as it was in the 60’s with traditional noodles and congee being their claim to fame. I came for their famous noodles and my guide Jeannie filled me in on what makes Ho Hung Kee’s noodles more special than any other noodle place in Hong Kong. 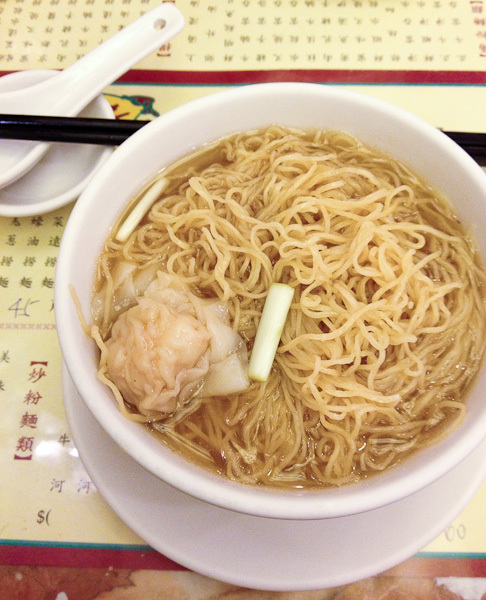 Unlike many shops whose noodles can be somewhat mushy, Ho Hung Kee’s have a slight crunch when you bite into the tangle of noodles dangling from your chopsticks; to use an Italian term, they’re pleasantly al dente, and swimming in a fragrant broth flavored with shrimp shells. 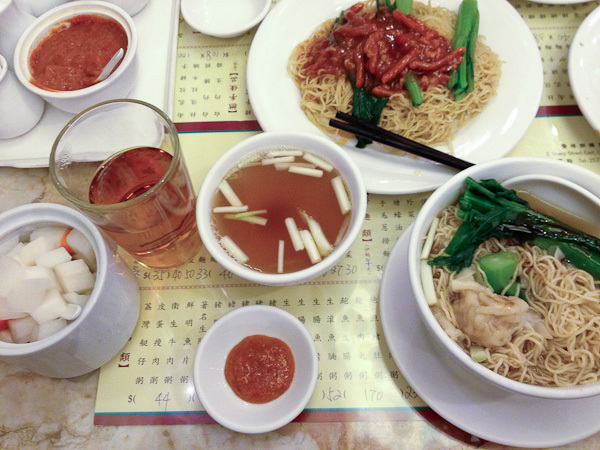 With a pot of Pu ‘er tea, a side of gai lan, an order of pork with house sauce (think shredded pork with a sweet/sour hot garlic sauce), and a few pickled vegetable condiments, a humble bowl of noodles is transformed into a colorful and satisfying meal (for two) – total cost: HK $148.00, about $19.00 USD. If you’re not of Asian descent, you may be unfamiliar with congee – it looks a little like watery rice pudding or cream of wheat, but it’s a traditional dish that is much more than the sum of its parts. After simmering since the early hours of the morning a simple mixture of rice and water or broth is transformed into a creamy comfort food that is the Asian equivalent of our Chicken Noodle Soup – what your mother makes you when you’re down with a cold, an anti-inflammatory and, basically, a cure-all for the blues. The happy cook stirring the congee. Added bonus of interesting people watching: we had the brusque sounding waitresses, the happy cook who chattered and whistled while he worked and the grumpy cook whose pained expression remained in place from the moment the galvanized aluminum door rolled up. Alas, if you want to enjoy the old world ambiance of Ho Hung Kee, you’ll have to make it to 2 Sharp Street East before May, 2013. Our server explained to us (actually my guide) that they have opened a new location at a nearby glitzy mall so the owners could serve the droves that have come and expand the menu – but also because the landlord decided to triple their rent. See what happens when you earn a Michelin star! I mean, if you saw this place, you would know that capital improvements was certainly not the basis for the rent increase. There was construction going on – actually concrete being wheeled from a dilapidated building to a huge dumpster directly in front of the shop, but it served only as a conversation starter for those of us queued up.